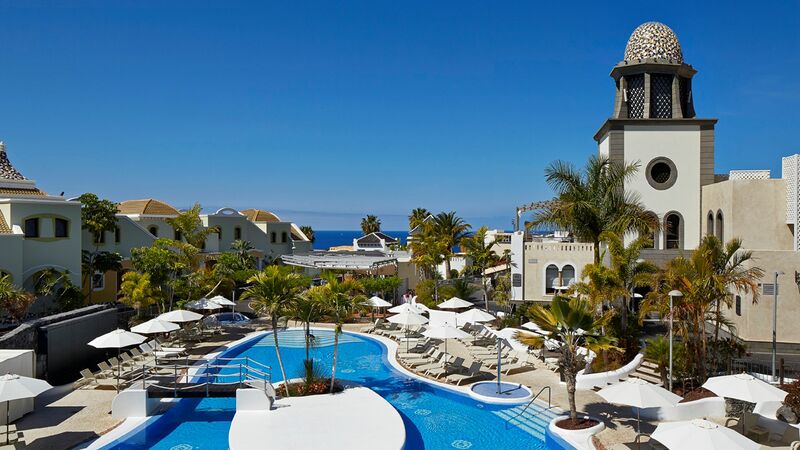 Step into a Canarian style sanctuary of calm and tranquillity that oozes authentic charm, just minutes from the beautiful resort of Costa Adeje. Select from 78 extensive villas decorated in contemporary neutral tones creating an inviting and relaxing ambience ideal for holiday mode. Set within manicured gardens, guests can enjoy views over the Atlantic Ocean, the golf course, and the dramatic mountains in the distance. The hotel is also just a kilometre away from La Caleta beach. La Torre restaurant will tantalise your taste buds offering fresh, locally produced ingredients that have been created into masterpiece dishes, while refreshing cocktails are served at the Bar Plaza as you watch the spectacular Tenerife sunset. Families will enjoy choosing from three swimming pools, and younger guests will be kept entertained at the complimentary Kids Club, suitable for ages 4–10 years. There is also a range of sporting activities available including squash and mini golf in addition to a well-equipped gym. Hotel child prices apply to ages 4–11 years. The Hotel Suite Villa Maria has 78 villas. Specially modified villas for people with reduced mobility are available on request. La Torre will keep your appetite satisfied all day long, starting with refreshing buffet style breakfasts including fresh fruit and cooked fry-ups overlooking the plaza and pool. As evening draws in, enter a more intimate and stylish atmosphere where you can sample fusion cuisine, including authentic Canarian dishes with a twist and international dishes transformed into artistry. Open: For breakfast and dinner. Sample a selection of snacks, light bites and main meals for both lunch and dinner. 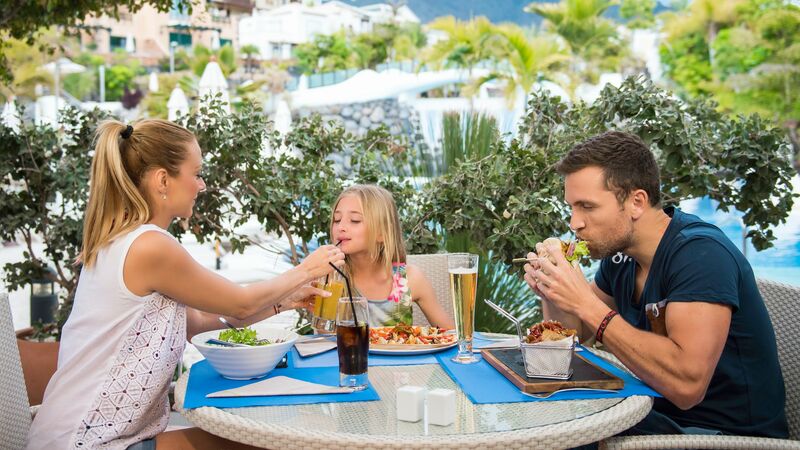 Enjoy alfresco dining while overlooking the pool and a range of à la carte dishes to suit all tastes. Gin Corner is a must for those seeking an extensive menu of refreshing gin varieties. Guests will be spoilt for choice with three freshwater swimming pools available at the Hotel Suite Villa Maria, including a separate swimming pool for children. 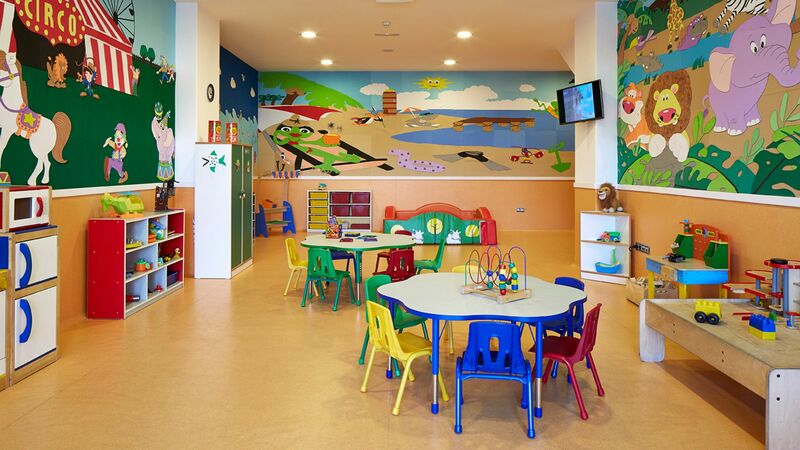 The exclusive children’s entertainment service offers a full range of activities to younger guests including games, sports, and arts and crafts, allowing the whole family to fully enjoy the holiday. There is also an indoor and outdoor playground. The Hotel Suite Villa Maria offers a huge range of sports and activities including squash courts and mini golf, in addition to providing access and a complimentary daily shuttle to the famous 18-hole Los Lagos Golf Course. There is also a gym featuring the latest equipment. Hotel Suite Villa Maria is nestled between the beautiful greens of Costa Adeje’s golf course. It’s ideal for golf lovers, as well as those wanting to simply relax on the beach. Just minutes away you’ll find little coves and pebbly bays, while Costa Adeje’s two main beaches are also within easy reach. With Blue Flag status, sand imported from the Sahara Desert, water sports and a host of restaurants, bars and cafés there is something for everyone here. Families will love the water sports and child friendly restaurants, while there are two water parks within a 10 minute drive of the hotel. Adults can enjoy some exquisite cuisine, as well as three shopping malls within easy reach. Hotel Suite Villa Maria is a 20 minute drive from Tenerife South Airport. One Bedroom Villas are split over two floors. The ground floor has a fully equipped kitchen, lounge and furnished terrace area with either mountain or sea views. Upstairs there is a spacious bedroom, en suite bathroom with hydromassage shower and a furnished balcony area. Two Bedroom Villas comprise of a bedroom, bathroom, fully equipped kitchen and lounge with dining area leading out to the terrace. There is an additional bedroom, en suite bathroom and furnished balcony area on the upper floor. Two Bedroom Villas with Outdoor Jacuzzi® comprise of a bedroom, bathroom, fully equipped kitchen and lounge with dining area leading out to the terrace with Jacuzzi®. There is an additional bedroom, en suite bathroom and furnished balcony area on the upper floor. Three Bedroom Villas feature two bedrooms on the ground floor and one on the upper level. Each bedroom has its own en suite bathroom with hydromassage shower. On the ground floor, there is a fully equipped kitchen, lounge with dining area and a furnished terrace which leads to a private pool which benefits from views of the mountains, golf course or sea. Guests booking Half Board for a minimum of 7 nights will receive the Half Board free for 3 nights when staying in a One Bedroom Villa, Two Bedroom villa or a Two Bedroom Villa with outdoor Jacuzzi for stays between 01 May - 15 October 2019 booked by 31 March 2019. Guests booking a stay for a minimum of 7 nights on a Bed & Breakfast basis will receive 25€ per person per stay when staying in a One Bedroom Villa, Two Bedroom villa or a Two Bedroom Villa with outdoor Jacuzzi for holidays between 01 May - 15 October 2019 booked by 31 March 2019. This Hotel Credit has to be used inside the hotel. There were 4 adults and one child and from the start we were so happy! The staff were so helpful and polite and couldn?? ?t do enough for us. True 5 star treatment! The villas were fantastic, immaculate spacious and house keeping came every day. The pool and bar were again perfect. The breakfast was outstanding and catered to everyone?? ?s needs and wishes. As soon as we got home we are looking to book again for the same time next year!! We stayed here for 7 days.Everyone was very friendly from check in to restaurant.A free minibus ran everyday to Plaza del Duque every day if you needed it.Cars were kept in basement garage if you had a hire car.The villa was first class and very good quality with lovely views.Standard of cleanliness was very good with daily cleaning.Breakfast was excellent with a wide choice.Restaurant meals were good although I?? ?d go half board in future.As someone as said it?? ?s quiet which suited us.Lovely swimming pools although a bit cold to swim in at this time of year.If you need transport outwith the area frequent buses run a 10 minute walk away.The Wi-fi was free and fast which other places should aspire to. Lovely, relaxing hotel with spacious villas and grounds. Everything and everyone are well looked after. Even in the school holidays there was lots of space in the pools, terraces and restaurants. If you like late night loud music or to party in your villa all night, this isn't the place for you. It's definitely the place for us. We had a two bedroom villa for a family of four with kids aged 5 and 7. The villa itself was in good condition with great views and outside space. The pool was lovely and the kids generally had a great time but you couldn't really leave them do the activities by themselves as it was more like a series of half hour activities than a proper kids club. Breakfast was fantastic with lots of choice and high quality. The staff there were also very friendly but we found the main restaurant a bit stuffy in the evening and preferred the one by the pool where there was also a musician every other night. Dinner could also use a few more vegetarian options as it was pretty much just pasta for mains. Our third stay at Villa Maria. Great activities for our 4 year old, Bea who runs the kids club is wonderful and the kids really enjoy it. The mini disco at 5.30 is fantastic and a great opportunity for a social drink and chat whilst the kids are busy dancing. Downsides are not a great selection in the mini market shop for cooking in the villa, no supermarket nearby, and limited menus with horrible pizzas and mostly meat and chips on the kids menu, (although I understand a new chef arrived during our stay so hope that will improve). Would like to see healthier options on there, maybe some carrot and chamber sticks with hummus, and an earlier eating time for those with small children. Young children will like it and it?? ?s a good setting, nice views and we enjoyed a pool with our villa, but upgrading to a pool villa and adding full board this year was a lot more expensive (triple the price of a 2 bed villa with breakfast only and I?? ?m not sure that the cost was worth it. Also the villas are looking a bit tired and we had mould in the showers, Would be good to see some slides in the pool and heated water. It may be that kids over 5 would be bored there but the town is not far walk down the hill, the people with older children there when we were seemed to be out all day and just use the hotel as a base rather than resort. Also a lot of older golfers stay too as it is surrounded by a nine hole course giving lovely views. But this year it felt like the hotel was trying to be all things to all people and I couldn?? ?t really work out who it?? ?s set up for. Overall a good week that the kids enjoyed, but not sure we will return again, we could get better value for money elsewhere.